^ 1.0 1.1 Spencer, James F. The Metals of the Rare Earths. New York: Longmans, Green, and Co: 152. 1919 [2008-06-27]. 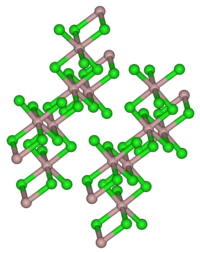 ^ Chemistry: Periodic Table: Thulium: compound data (thulium (III) chloride). WebElements. [2008-06-27]. （原始内容存档于2008-12-01）. ^ Perry, Dale L.; Phillips, Sidney L. Handbook of Inorganic Compounds. CRC Press. 1995: 512 [2008-06-27]. ISBN 0-8493-8671-3. ^ 439649 Thulium(III) chloride anhydrous, powder, 99.99% trace metals basis. Sigma-Aldrich. [2008-06-27].